YEREVAN. – The Criminal Appellate Court of Armenia on Thursday rejected the petition to commute the restraining order of well-known actor and comedian Vardan Petrosyan, who is under arrest in connection with a road accident on October 20 (Photos). The court will make public the reasons in three days, actor’s lawyer Nikolay Baghdasaryan told the crowd gathered to support Petrosyan. To note, a major accident occurred on October 20 in Kotayk Region. A BMW and a VAZ 2121-model vehicle crashed at around 9:20pm on the Yeghvard-Yerevan motorway. As a result, seven people sustained injuries and were transferred to several hospitals. 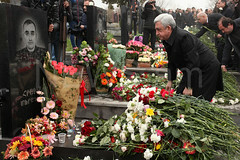 Among them was famous actor and comedian Vardan Petrosyan, whose liver and spleen had ruptured. His spleen was removed, his ruptured liver was stitched, and he recently was discharged from hospital. 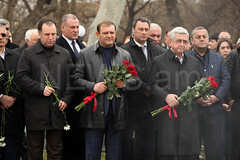 As a result of the accident, however, cousins Edgar and Eduard Hakobyan—who were passengers in the VAZ 2121—had died. 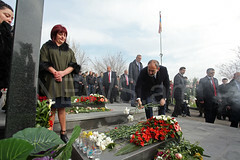 A criminal case is instituted on the incident, Vardan Petrosyan was formally arrested, and he was kept at a prison hospital. But since he has heart issues and these problems aggravated recently, the renowned actor was taken to a cardiovascular medical center on Monday.